The appeal of the Upanishads is all the more relevant today, in this modern age of science and reason, than ever before. The Upanishads were a great source of inspiration for several of the greatest modern scientists, particularly the early fathers of Quantum Mechanics like Schrodinger and Heisenberg, who ushered in revolutionary changes in our world-view-weltanschauung. Oppenheimer, the father of the atomic energy revolution in science, was greatly fascinated by Vedantic thought embedded in the Bhagavad-Gita and the Upanishads. Swami Vivekananda believed that the wonderful, rational system of Vedanta, particularly the Advaita Vedanta, will be the future religion and philosophy of thinking humanity. 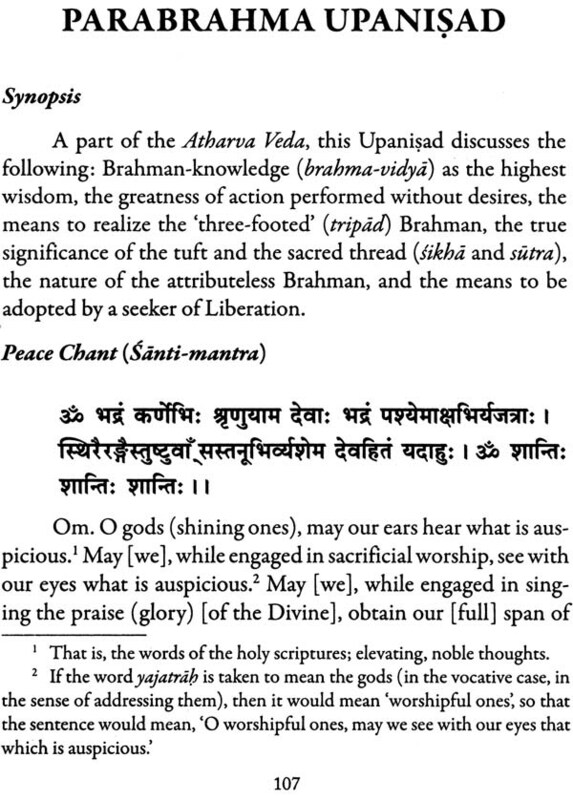 The Upanishads form the sruti prasthana among the prasthana-traya, the three canons that form the foundation of the philosophical system of Vedanta, the other two being the Bhagavad-Gita, called the smrti prasthana, and the Vedanta Sutras or Brahma Sutras, called the nyaya prasthana. These three prasthanas or canons are respectively the theoretical, practical, and rational basis of the Vedanta philosophy. 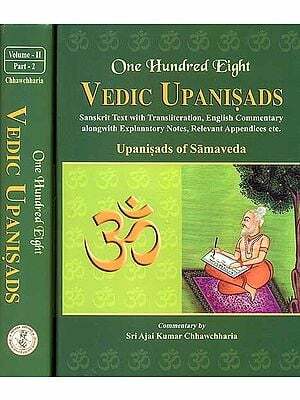 The entire body of the Upanishads is believed to comprise a hundred and eight books, shortlisted later to twenty-eight, but the ‘major’ Upanishads are just ten plus one. These ten plus one ‘major’ Upanishads are so called because Shankaracharya, the great teacher of Advaita, wrote his immortal commentaries (called bhasyas) on these ten plus one Upanishads. While it is an undisputed and well accepted fact that he did write the bhasyas on the following ten Upanishads, namely, Katha, Kena, Mundaka, Mandukya, Isavasya, Prasna, Taittiriya, Aitareya, Brhadaranyaka, and Chandogya, there is some doubt as to the commentary on the eleventh Upanishad, Svetasvatara, which, although attributed to Shankaracharya, may not actually be written by him. Hence we have chosen to say safely that the number of ‘major’ Upanishads is ten plus one, rather than say eleven. 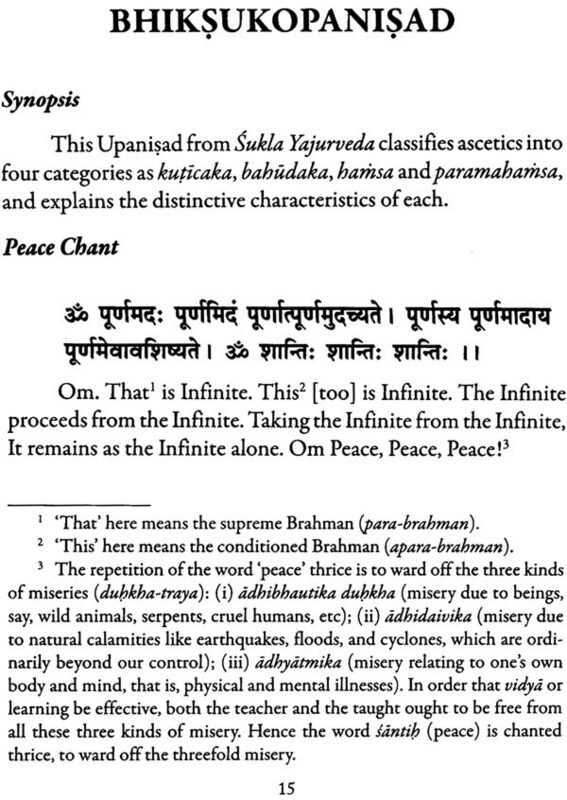 The rest of the ninety-seven Upanishsads, other than the eleven ‘major’ ones, are sometimes called ‘minor’ Upanishads. There are some very sublime passages found in the ‘minor’ Upanishads and Shankaracharya, although not choosing to write commentaries on these ‘minor’ ones, often quotes from them to reinforce and elucidate his statements and arguments in the commentaries of the ‘major’ Upanishads. 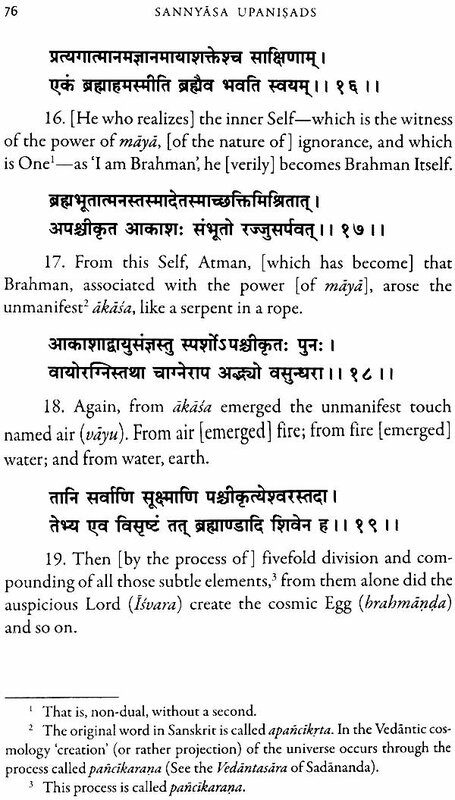 This shows the importance of these ‘minor’ Upanishads also. 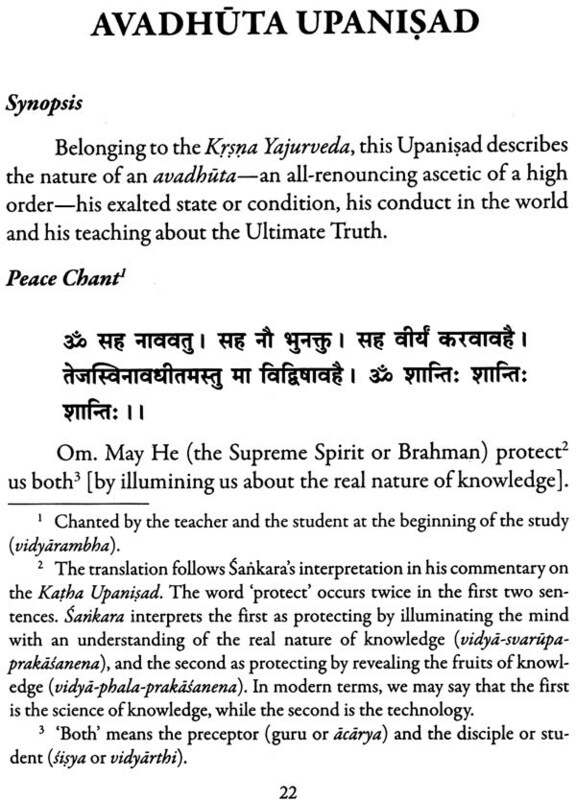 Upanishad Brahmayogin, a great scholar-saint, about whom we seem to have little information, wrote fairly elaborate commentaries on all the one hundred and eight Upanishads-a feat of great intellectual and spiritual genius. The Adyar Library and Research Centre at Madras has done a remarkable service for the Vedanta literature-particularly among the English-knowing and less Sanskrit-knowing public who are nonetheless eager to learn about the truths of Vedanta embodied in the Upanishads- by bringing out a series of volumes of the entire body of the Upanishads, both major and minor, with English translations based on the commentaries of Upanishad Brahmayogin. This exercise of theirs began as early as the very beginning of the twentieth century, almost contemporaneously with Swami Vivekananda’s exposition and propagation of Vedanta in the Eastern and the Western worlds, or thereabouts, and has been continuing through the late twentieth century with revised editions and publications. The Adyar Library and Research Centre at Chennai therefore deserves the respect and gratefulness of all the avowed students and scholars of Vedantic thought as well as aspirants and seekers of Vedantic wisdom. We also gratefully acknowledge our indebtedness to these volumes which have been of great help in the preparation of the present volume. 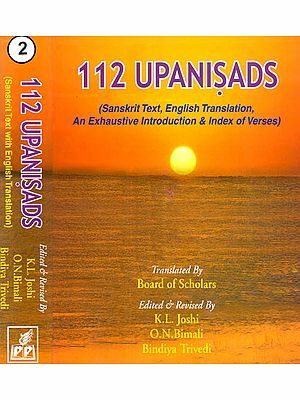 It is therefore in the fitness of things that the Ramakrishna Order of sannyasins should publish a translation of the Sannyasa Upanishads with explanatory notes based both on the traditional interpretation by Upanishad Brahmayogin as well as on Ramakrishna-Vivekananda thought. The copious notes herein reflect both these ancient and modern interpretations. Advaita Ashrama, founded by Swami Vivekananda himself in the lap of the Himalayas, has a long tradition of publishing Vedanta scriptures with English translations of the original texts along with Shankaracharya’s commentaries, particularly of the Upanishads, with elaborate notes wherever necessary. 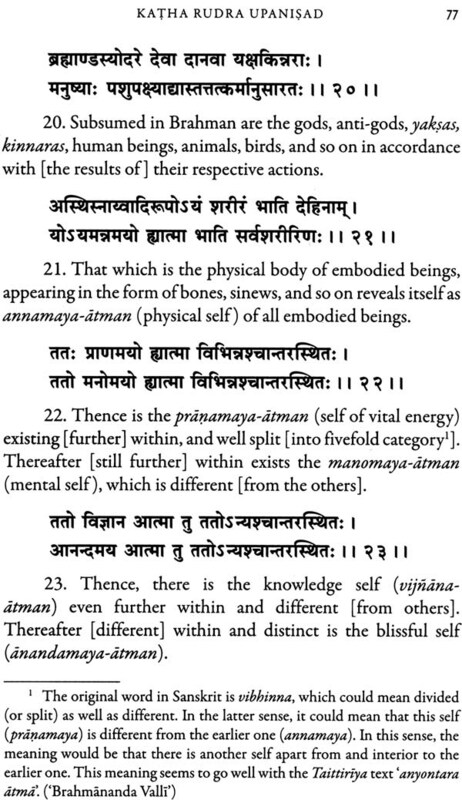 Swami Madhavanandaji’s translations of the following Vedantic and philosophical texts, namely, Brihadaranyaka Upanishad, select minor Upanishads, plus one representative text of three of the sad-darsanas (six orthodox systems of Indian philosophy), namely Nyaya, Mimamsa, and Vedanta, are cases in point. The rich translation literature of the scriptures by Swami Gambhiranandaji, who untiringly translated the. fundamental texts of the prasthana-traya with Shankaracharya’s commentaries-that is, all the major Upanishads, the Bhagavad-Gita (with commentaries of both Shankaracharya and Madhusudana Saraswati), and the Brahma-Sutras-is a jewel in the crown of Advaita Ashrama’s publication treasure-house. 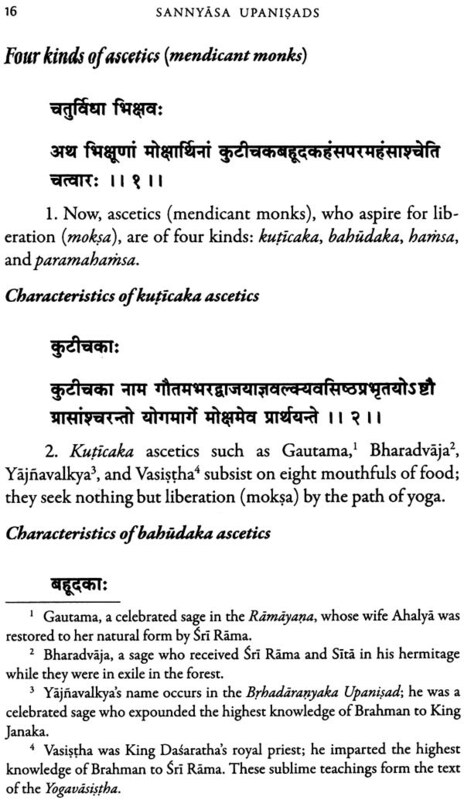 To this list may be added so many of the prakarana granthas-that is, independent Vedanta works, like Vivekacudamani, Astavakra Samhita, Aparoksanubhuti, Atmabodha, Drg-drsya Viveka, jivanmuktiviveka, Pancadasi, and several others. The present volume is a humble attempt along the lines of the above translation literature published by Advaita Ashrama. The Sannyasa Upanishads, besides being of special importance in the monastic tradition of Ramakrishna-Vivekananda, also bring to us, moderners, a vivid description of the ascetic, austere, and elevating ideal and practice of the spirit of renunciation, or sannyasa, in ancient times. 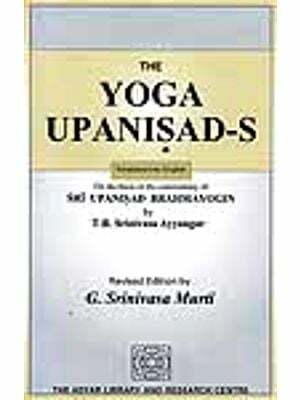 Of the seventeen Sannyasa Upanishads, Swami Madhavanandaji has already included three-namely, Arunyopanisad, Paramahamsopanisad, and Brabmopanisad-in the volume tided Minor Upanishads translated by him and published by Advaita Ashrama. 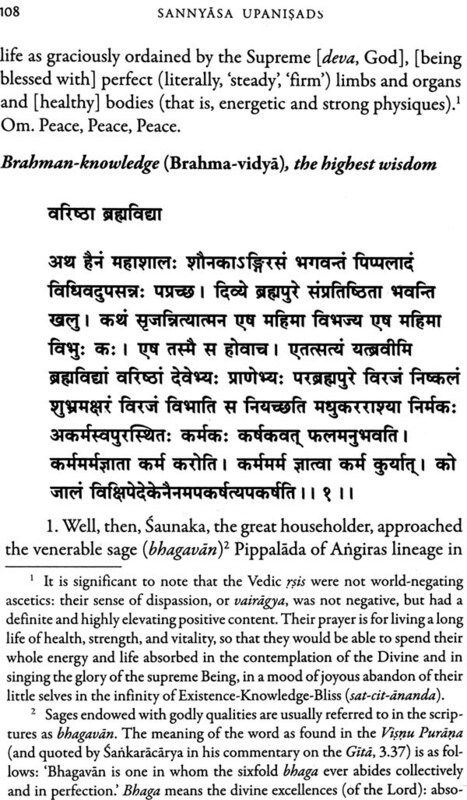 Of the remaining fourteen, the present volume contains seven-namely, Avadhutopanisad, Katharudropanisad, Kundikopanisad, jabalopanisad, Turiyatita Avadhutopanisad, Parabrahmopanisad, and Bhiksukopanisad, which have been translated herein by the present author. A second volume in this series, containing the remaining seven of the Sannyasa Upanishads, is under preparation and will be published as soon as it is ready in final form. We believe that the present volume of seven of the Sannyasa Upanishads will kindle in the minds of the readers a deeper desire to learn more about the unique system of monasticism, sannyasa-its ideals and practice in ancient times-and help them realize the great value of renunciation and self-sacrifice in modern times in the light of Swami Vivekananda’s ideal embodied in his aphoristic dictum: “atmano moksartham jagaddhitdya ca’, for one’s own liberation and for the good of the world-the modern ideal of sannyasa. Om Tat Sat-’Om That Existence’. Sri Ramakrsnarpanamastu: May this endeavour be a humble offering to Sri Ramakrishna, the King of renouncers, Tyagisvara, an epithet used by Swami Vivekananda to describe his Master’s supreme and exemplary spirit of renunciation. Swamiji said that this immortal treasure lies in Vedanta, in the Upanishads. He believed that the wonderful, rational system of Vedanta will be the future religion of humanity. In a humble effort to actualize this vision of Swami Vivekananda, Advaita Ashrama, founded by Swamiji himself in the lap of the Himalayas, has been consistently publishing and propagating the message of the Upanishads since its very inception. The original Sanskrit texts along with English translations of the original mantras, as well as the commentaries of Shankaracharya thereon have been published by Advaita Ashrama on all the major and some minor Upanishads, which have become immensely popular. In the same line comes the present book containing select minor Upanishads which have a special bearing on renunciation or sannyasa, and hence are called Sannyasa Upanishads. They contain inspiring passages revealing the sublime thoughts of our ancient sages on the life of renunciation, asceticism, and complete absorption in Brahman, the Supreme Reality, Existence-Awareness-Joy, satchidananda. The present volume is the first in the series, and a second volume is under preparation. Elaborate explanatory notes have been added based upon, and in the light of, the commentaries by Upanishad Brahmayogin and the teachings of Swami Vivekananda. We believe that this addition to the Upanishadic and Vedantic literature already published by Advaita Ashrama will serve a great purpose in elevating and enlightening, enabling, and empowering the minds of modern men and women living in a panic-stricken, strife-torn, conflict-ridden world of increasing uncertainty.